storm, something bigger was needed, and it needed to be large enough to hold the new Solaris cannons, the largest guns designed by Terran engineers. After Drathonian tactics changed in response to the initial Terra class, It was realized that a different ship would be really needed. 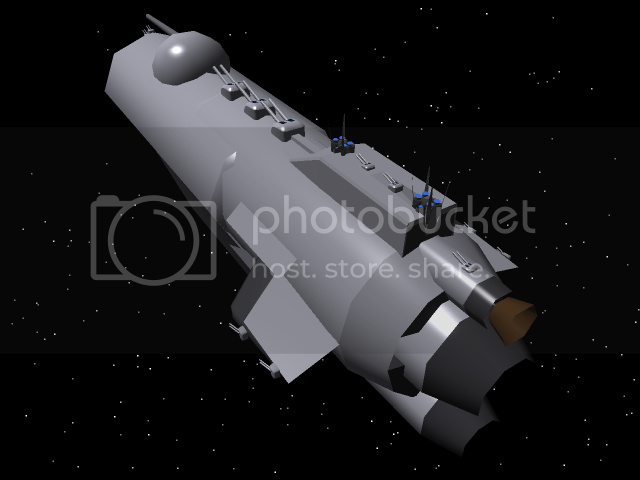 The Original Terra class had been an all-purpose ship, with a lot of space dedicated to troop carrying, and not enough dedicated to actual space combat. Emphasis was put on making the Terra II capable of engaging as many enemies at once as possible, instead of relying too heavily on the Solaris cannons, whose overwhelming advantage was defeated by simple change in tactics. **Range:limited to 6 months by supply caches,the more people on board, the shorter the range. With the removal of most of the Marines based on the ship, A main armory was less of a necessity, and was replaced instead with several smaller armories spaced around the ship, on every deck. These armories are small and mostly contain small weaponry, such as handguns and submachine guns. On the Hangar deck, there is a larger armory, to centralize the weapons of the few marine squadrons left on the ship, as well as to help with staging of invasions on the hangar deck. The Bridge is a large room, moved from its original position on the nose section of the ship to be a buried central command center within the structure. It contains 15 stations, Including the Command chair, the first officer's seat, communications, weapons control, and several other stations. The middle decks contain a large item storage area for storing all the food and clothing needed to be used on the ship. The bottommost level contains raw material storage for the replicator's use. The hangar may double as cargo storage in an emergency. The bunking of crew has been completely reorganized, shifting away from the large communal rooms for enlisted and the slightly smaller private rooms for officers. Efforts have been made to provide more comfort while consolidating the smaller numbers of standard crew. Higher-ranked officers retain their normal sized rooms, where as junior officers stay in shared rooms which hold two each. these rooms are stocked with everything the officers need, and are very comfortable. Enlisted are switched from staying in barracks to staying in bunk rooms, the same size as junior officer quarters, for people are put in each as opposed to two. The layout of these rooms has been changed with the change in the number and height of decks, allowing them to be two-story affairs reached from a central door. Stairs lead up and down from these doors into quarters rooms, allowing for twice as many rooms to be on each deck. This is done at the cost of armor plating between decks in these areas, but placed deeply in the ship, it does not matter. there is a gym located on the middle deck of the ship it contains weight rooms, excercise machines, and small sports arena things for recreation. the main engineering section has a second set of controls for the ship, and has acess into every system of the ship. it is located near the engines for ease of access. There are smaller engineering sections based around the ship which consolidate tools and emergency equipment where it is most likely to be needed, to keep Engineers from having to lug heavy equipment all around the ship. there are maintenence conduits going through many corridoers to important parts of the ship. The largest ones are called warp conduits and carry energy to the engines from the main generators and any backup generators that are turned on. coming into the ship to have a place to go quickly. It is reached from the hangar deck by several lifts and elevators, as well as stairwells in case the first two are out of service. The Medical center is nearly as large as a hospital, and has the capacity to treat half the crew at any given time. The Hospital is two storeys tall, but only takes up a single deck. the walkways are bare looking, but in no way plain. The carpet is dark and consists of greens blues and blacks, and the walls are different colors on each level, to aid in telling them apart. The hangar deck has taken over the entire central bottom section of the ship, moving into the space formerly occupied by the medical center, as well as some barracks that had been moved. With the change in the amount of decks and the space between them, The Hangar deck was given special attention, as it would become a staging area for operations, as well as a place to store fighters, and even bring small support ships along, which, due to their much slower nature, would have been unable to arrive with the Terra under their own power at many battles. The New Hangar system allows the Terra to carry up to 200,000 Scimitar fighters, but, with obviously nowhere near that many people on board, it only carries 5,000, 800 of which are reserve and do not have dedicated pilots, but are rather to allow a pilot to quickly switch out of a damaged ship during battle. The remainder of the space is left for allowing corvette-sized and smaller classes inside, the 400 foot tall, 750 foot wide bay doors allowing them access. These doors, on top of the normal magcon fields, also have armored sliding door sections, allowing the Terra to close itself up during transit, and to close itself up once its support ships have been launched, with smaller sub-doors allowing fighters and shuttles to continue to pass in and out. In response to the much larger bay, more replicator systems were added, bumping the single replicator to a much more serviceable number of 15. The Boarding pod system was removed, the pods themselves dangerous and the mass drivers that launched them using power that was better utilized in more turbolazer batteries. Instead, boardings are to be done using specially designed heavy assault shuttles, of which the Terra II can hold 20. The Brig is a small section placed near the outer section of one of the upper decks. It contains jail cells and is self-contained, meaning that, if necesary, it could be vented. It is the place where soldiers are sent after an infraction, as well as prisoners of war. The ship has an AI supported by an ASIAN unit as the ship's avatar. these units can either be set as the ship's commander or as an aide to the commander, and excell in both fields. there is a life support system throughout the ship that constantly cleans and recycles air. It utilises a photosynthesis like process to clean the air and create sugars which may be used on foods. The warp drive allows the ship to move many times the speed of light. during battle, the warp drive allows the ship to change it's direction of travel almost immediately by use of warp conduit output ports on every side of the ship. The Main STL propulsion is provided by a pair of absolutely monstrous Energon diffusion thrusters, which convert the energy from the Energon drives directly into an extremely powerful high-speed plasma. Ships traveling too close behind the Terra II can be damaged or even destroyed by the thruster wash. The ship is powered by an Energon drive, the largest in exestence, capable of producing enough power in one minute to light up an entire planet full of lightbulbs for five years. The Terra class battlecruiser has an extremely formiddable multi-layered Plutanovicz shield system, made to be superior to any system the drathonians have, barring the enormous one on DEMONIX. The Terra's Shield system is extremely powerful and specialized, projecting three independednt layers, each layer made of a network of hexagonal shield sections, which rotate around the ship in a fairly random order, allowing damaged shield sections to be moved out of the way. These grid sections may additionally be turned off individually, allowing the ship to fire through the shield without having to completely turn it off. 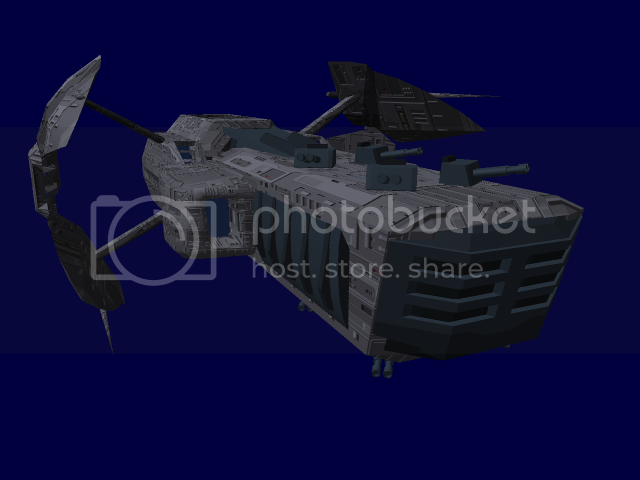 Solaris cannons (2): The primary weapons are two side mounted Solaris cannons. A cannon more powerful than the Solaris is under development, but will not be available for some time. Damage: Extremely Heavy. Destroys almost everything in its path. Vessels just outside of this radius may be destroyed or damaged by the leakage of the beam. Rate of Fire:The Solaris cannons must be charged before firing. this charging process takes approximately fifteen minutes per cannon. Notes: Shields must be down for this cannon to fire. Turbolaser Arrays (12): These weapons are quad-barreled anti-starship shield penetrating weapons. They can also be anti-shuttle or used as an active countermeasure against solid projectile ammunitions. These cannons are a vast improvement over the old versions, with increased range and fire output due to the re-routing of power from the Solaris cannons and the old hangar-mounted mass drivers. Notes: only requires a small portion of the shield to deactivate to be fired. Neck-mounted Torpedo tubes (4): These tubes are forward-facing fixed tubes which fire self-correcting heavy anti-ship torpedos. They can also be used for orbital bombardment. Notes: there are Several kinds of Torpedos, depending on the desired effect. One is your standard Nuclear warhead, another an antimatter warhead, a third an EMP torpedo, and a fourth flechette-type torpedo meant for anti-fighter/shuttle/support ship duties. Pulse laser arrays(400): these weapons are the best defense against fighters, projectile weapons, boarding pods and shuttles available. they are placed all over the hull under panels, and come out when needed. Damage: medium. can hurt both shields and armor, the pulse type shot can be calibrated to specific wavelengths to allow instant deactivation of fighter shields, like an EMP pulse. Notes: only used on things inside the ships shields unless in an emergency. This ship was the Standard terran warship for the past 15 years, designed just before the great betrayal, it lacks several key things needed to effectively combat Drathonians. 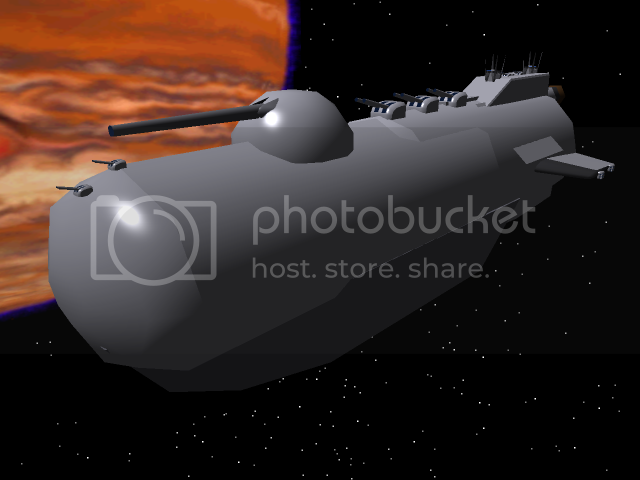 The OUTO military needed a cruiser capable of holding it's own against the forces of hostile space nations it was combatting with the help of the Drathonians. Just before the last of the genocides was finished, OUTO created the Mars destroyer, which had the power to make devastating blows when used in groups of two or three. **Pilots:** 1 minimum, 4 maximum, 2 reccommended. **Maximum Capacity:** 500 can fit aboard in an emergency. The armory is a large room containing every personal weapon on the ship. it also has a small set of replicators to make replacement parts for guns. the bridge contains numerous work stations that control every function of the ship. the engineering section has a second set of controls for the ship, and has acess into every system of the ship. it is located near the engines for ease of access. there are maintenence conduits going through many corridoers to important parts of the ship. the largest ones are called warp conduits and carry enrgy to the engines from the main generators and any backup generators that are turned on. The Medical center is top-of the line, on par with the Terra class's, except much smaller. The Mars class has Thick Duratanium plating, making it the third most heavily defended ship, behind the Jupiter and Terra. The Mars-class contains enough escape pods to save the entire crew. The ship is powered by an Energon drive capable of producing enough power in one minute to light up an entire planet full of lightbulbs for two years. The Mars uses a high-efficiency Plutanovicz Shielding system. Turbolaser Arrays (1): These weapons are anti-starship shield penetrating weapons. They can also be anti-shuttle or used as an active countermeasure against solid projectile ammunitions. Pulse laser arrays(75): these weapons are the best defense against fighters, projectile weapons, boarding pods and shuttles available. they are placed all over the hull under panels, and come out when needed. Designed around 130 years ago, the Pluto-class was the first ship to have effective energy shielding. It was used at the end of the Rim-world rebellions to help seek out and crush the last vestiges of the rebels. Now it is being called back into duty to replace the Terran forces lost in the Battle of Terra IV. An inventor named Istvan Plutanovicz created the first Practical energy shielding, capable of blocking both energy and solid weaponry. 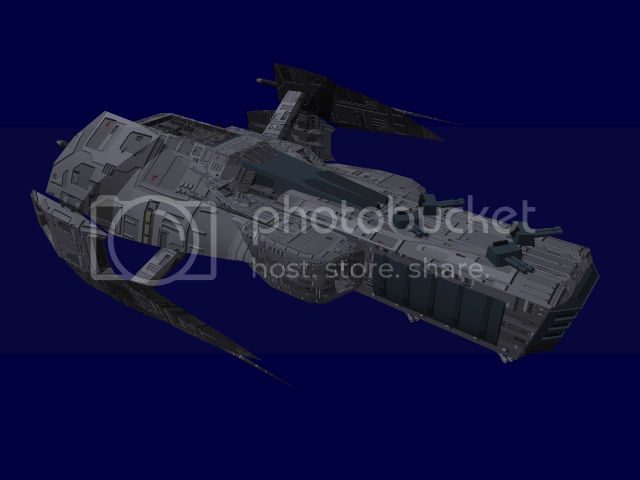 Tho use his design, a new class of ship was made specifically to carry and utilise the system to it's fullest extent. crew compartments are normal bunk rooms, built for two people each. The armory is on the top deck, near the airlock. The bridge is a cramped room heaped with equipment and work stations. Near the bridge is the captain's suite, a 15' by 25' room that is very luxurious. These snake their way through every part of the ship. a very small person is needed to get through them. Also near the airlock, the medical center is small, but well-stocked and capable of any surgery any other terran ship is capable of. 5' wide by 15' tall. These ships have been upgraded and retrofitted throughout their lives and have varios computer systems, all up to code with Terran standards, however. Corridors are capable of being sealed for hull breaches, and to isolate intruders and poison them. Most run on antiquated Ion drives, that are however efficient, if slow. Small warp drives have been added to these, giving them a mean average of 25 LY/min warp speed. some are faster, some are slower. They use Plutanovicz Shield systems, a basic system capable of blocking both Beam and projectile weaponry. 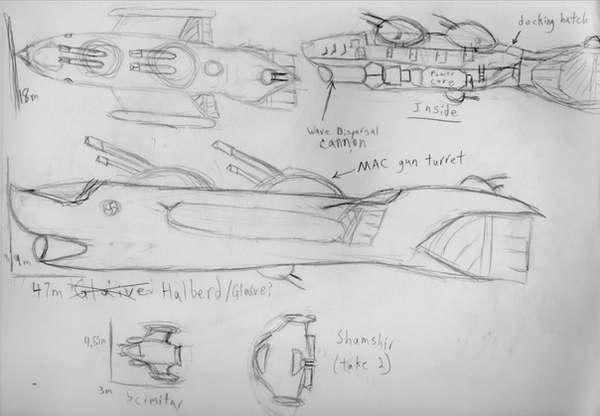 Each Pluto class has 60 missile/torpedo/countermeasure tubes, plus an Ion-cannon turret for defense against fighters. 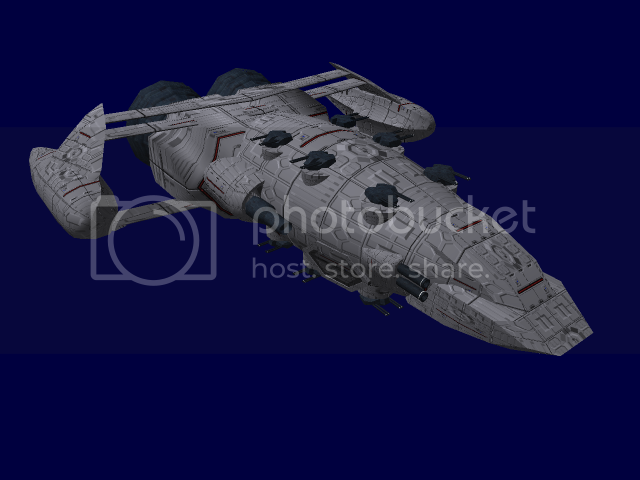 The Iroquois is a scout carrier, a small ship with relatively powerful defenses, and the capability to carry fighters, which it can use to defend itself, and even extend the range of its sensors temporarily. There was noted a need for small, fast ships lugging heavy sensor capability. 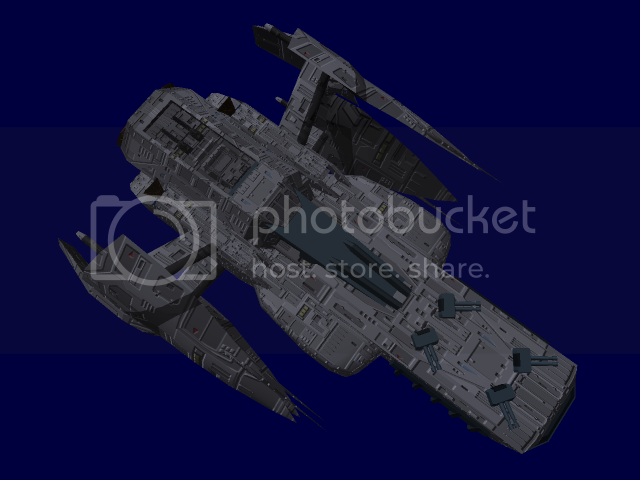 since this ship would be doing solo missions, it needed to be fairly heavily armed, and capable of tefending itself. the most effective method was starfighters. Thus, the scout carrier was born. **Maximum Capacity:** 400 in an emergency, but the ship would be extremely cramped. The forward section is two decks tall, most of it is taken up by the cavernous fighter bay, which spans two decks. The nose of the craft contains a large amount of sensor equipment. In the rear section, it is three decks tall, the upper deck being the bride and command and control center, the middle deck containing living quarters, and the lowest containing storage. The bridge is hidden underneat the hull, and contains all the stations necessary to the control of the ship and its fighters, and sensors. The captain has a 5m by 5m room with a large bed, a desk/office, and a viewscreen, as well as a small private bathroom. The lower deack in the rear half of the ship is a huge cargo area. Enlisted crew share 3m by 3m rooms, while junior officers and officers get single 3m by 3m rooms The crew shares several public restrooms placed throughout the crew deck. The mess is a fairly large room in the center of the middle deck. it contains kitchens to prepare food, and serving areas, as well as bench tables to sit the entire crew. it is also used as a lounge, as it has viewscreens on all the walls. The engine section is snaked byaccess tennels and small rooms with gear for keeping the systems working. There is a small medical center on the lower deck. passageways are 1m wide, 3m tall passages, between the rooms, leading to all the important parts of the ship. Decks are reached by stairways, the hatches to which can be sealed and are airtight. Pasageways are bisected by bulkheads at several points, which can be closed to contain hole breeches. The hangar bay is the largest single chamber on the ship, a 70 by 50 meter room, which is 40 meters tall it contains the ship's fighter compliment, cranes in the cieling to move stuff around, and a small set of replicators to build spare barts. The Hull is made from Titanium, with a thin plating of Duratanium, which in turn is covered in Titanium Dioxide, to brovide sensor stealth and light laser deflection. The Iroquois has a surprisingly powerful computer system for such a small ship, made specifically to process the huge amount of sensor data brought in by the ship. This Computer system includes a ship-wide wireless network, and is capable of full support of an ASIAN unit. Every room, and many sections of passageway are capable of being sealed to counter hull breaches. Every compartment and passageway has a fire suppression system. there are enough escape pods for the entire crew to escape. The entire ship has an air scrubber system, which keeps the air clean for up to seven months, before the scrubbers must be replaced. The ship uses a Warp Drive for normal Faster than light travel, as well as a Fold drive for line-of-sight and trans-galactic jumps. STL propulsion is done with High-efficiency Ion thrusters, allowing the ship to function even under reduced power output. Extremely large Deflectors project a surprisingly powerful Plutanovics shield system, with a honeycomb shield pattern. the shield bubble itself is rotated constantly, bringing reduced power portions out of the line of fire. The ECM (Electronic Counter Measure) suite is capable of scrambling enemy sensors, as well as giving out 'false readings' as to confuse enemy fighters. The complex array can 'confuse' enemy craft by creating white noise to cover up the actual sensor ping that the enemy sends out, and then simulate a weak sensor return ping with it's own signals. The effects of the suite may range from a completely fuzzy tactical scan screen, to over one hundred individual simulated contacts, and may be varied at will. It can easily follow enemy sensors to the source, make a small object appear larger on sensors than it actually is (but not the inverse), as well as absorbing an enemy sensor ping. After absorbing a sensor ping, the suite may also 'return' the ping after a longer time than normal, creating the illusion that the Iroquois class ship or friendly unit is farther away than it actually is. Mostly defensive, Ion cannons are made to disable enemy ships, allowing them to either be taken out by a ship with more powerful weapons, or giving the ship time to escape. These launchers, on either side of the ship, each hold four mini, self-guided torpedos, which are specialized to find holes in shields to increase chances of impacting a hull. the Hangar bay can hold up to four shuttles. it uses holds only one. The Hangar bay can hold up to 12 Scimitar starfighters, but normally carries only six. As it's name suggests, the ship is designed to literally hunt and kill fighter craft who enters it's assigned patrol area or those that too close to it's ward. 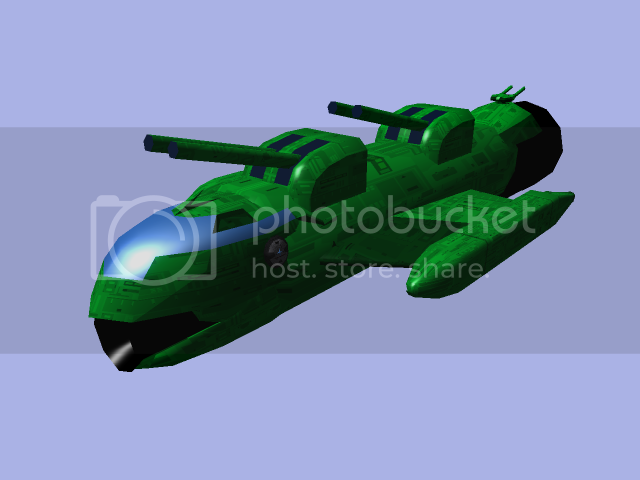 The ship's defenses are durable enough to withstand enemy Point Defense Weapons, as well as anything a conventional fighter-craft can throw at it. Powerful engines allow the ship to keep pace with friendly and hostile fighter craft, while special oversized maneuvering thrusters enable the corvette to keep on target and dodge incoming fire. It is armed with two Rail Guns designed to snipe enemy fighters from a distance or even batter other corvettes, as well as sixteen Vulcan Rotary Cannons. With the possibility of an enemy fighter carrying a nuclear payload increasing, and the constant threat posed by other Corvette Class vessels, the Brass decided not to take any chances, and developed a brand new Corvette to further bolster defenses, and intercept enemy fighters farther out. The H-K falls into the category of Corvette, which has existed since the dawn of Naval warfare, and fills in the Terran Republic's gap concerning AA. Besides firing directed streams of rotary cannon fire, it was decided that the ship should be able to fend off other Corvette class ships; hence, the two Rail Guns. There are two decks aboard the ship, with each having access to the engineering room, or bridge. The two main compartments both have access to the ship's replicator located directly above/below the rail guns. In turn, the replicator appears to be either on the ceiling or floor, depending on which of the two decks. The engineering room lies off to the rear of the ship, with the bridge in the front. In order to reach the bridge, a person must go through crew quarters, with the upper deck of the quarters being the female crew quarters, and the lower being the males'. The captain has his or her own room that branches 'downward' from the bridge, and is small. In order to reach engineering, a person must first go through the cargo/storage area, which houses the replicator supplies. The ship does not have armories, however, there are survival kit lockers interspersed at key points within the ship which includes ready to enter EVA gear, weaponry, ammunition, medical supplies and liquid food. The bridge has an excellent view of whatever happens through the multiple view ports that dominate the small cabin. The Captain's Suit is a small spartan room with a bed, writing table, and reinforced/armored locker. Small, and often overcrowded with goods, the storage area is right before the engineering section of the ship. Spartan bunks and a single tall locker are provided for each crew member. More roomy than other rooms. This area triples as recreation area when all the bunks are folded up and pushed off to the sides, and as mess hall. Though small, the engineering compartment is surprisingly well thought out, allowing easy access to most of the associated machinery. None. The ship is simple, and open, with much of the machinery and equipment easily accessible for repair. A pair of large, walk in cabinets for each level in the crew quarters. Contains all the more 'serious' medical gear aboard the ship. Light armor plating that can be found on most fighter craft. Double Layer and Refraction Coat Laminated. Powerful tactical sensors and enhanced targeting systems capable of tracking enemy fighters in real time. Virtual Interface, and ASIAN comparable. Basic fire suppression. All crew is to wear vacuum suits during combat. EVA suits are located throughout the ship at work areas; propulsion included. Basic, reliable, old school air scrubbers located throughout the ship. The main engines of the ship are nothing special; the main point of interest would be the special oversized maneuvering thrusters. Since the rail guns of the ship can only fire forward in a 180 degree arc, these would rapidly reorient the ship enabling the guns to do their work. Besides that, they can literally blow the ship onto a new course as an evasive maneuver. Plutanovicz shielding system. The bridge has it's own generator, though weaker than the main unit. 35mm Vulcan Point Defense Weapon (16): These six barreled rotary cannons fire hyper-velocity armor piercing high explosive shells at enemy fighters with dead accuracy due to the enhanced targeting systems they are linked up to. They spit out at least thirty rounds a second, and can even adjust their cone of fire to shoot down missiles or improve the likelihood of striking a particularly difficult to hit foe. Upon the chance of targeting system failure, crew members can man the Vulcan Guns, with a single station able to control multiple turrets at once, focusing their firepower on one target. Ammunition is fed directly from the ship's replicator. Damage: Medium-Low. The projectiles must exhaust enemy shielding first. Will explode on contact against shielding after expending kinetic energy. Rate of Fire: 30-50 rounds a second, maximum RoF can only be held for two seconds mainly as anti-missile measure. Ammunition: 30,000 rounds ready. Infinite so long as replicators have material and power. 66mm Rail Guns (2): A pair of powerful, and exceedingly accurate rail guns are available for use. One on top, and another on the bottom. They are only capable off moving left and right within a 180 degree arch, and up to 69 degrees upward. It fires a depleted uranium projectile, smashing through almost anything in it's way; very, very, very fast. The turret is mostly restricted in movement due to heavy armor. Rate of Fire: 1 round every eight seconds. Ammunition: 66 rounds ready. Infinite so long as replicators have material and power. Non-direct feed; must be manually reloaded after 10 shots. The Neptune-class is, with the exception of the Terra-class, the heart of the fleet. 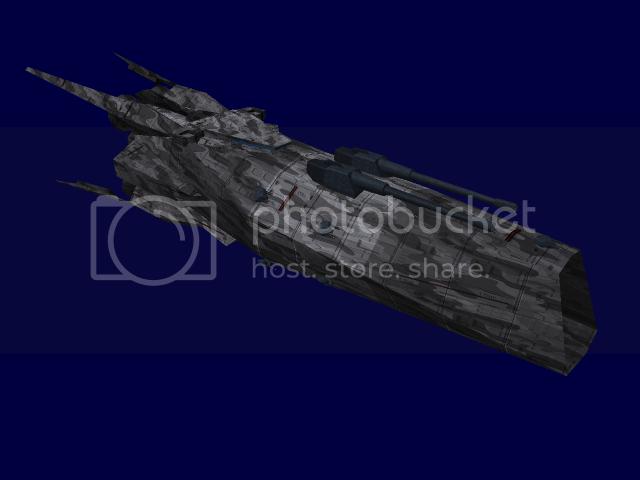 Each vessel serves as a fighter carrier, although they can alternately be designed to contain a miniature spaceport, capable of housing numerous small vessels. The Neptunes carry the bulk of the fleets assault fighters. With the release of the Scimitar series, the Terran Navy needed a support vessel that could house enough of them to serve an entire fleet. The Terra-class holds large hangars given its size, however, they needed a smaller, more easily produced vessel. The Neptune-class quickly proved to be produced faster than they could be filled, and thus were quickly put out of production to make room for more destroyers. 3 small armories span the ship: one in the fore section, one on either end of the hangars. The main bridge is located in the fore section, and is the size of an entire deck, with observation windows spanning 240 degrees of it. The secondary bridge is also the command center for all hangar activity, and is thus proportionally larger. The cramped living quarters of the crew allow for only a family-sized suite for the captain. Three entire decks in the aft section are dedicated to cargo bays, and ships can dock directly into them. Pilot quarters ring the hangars in the aft section. The fore end of the ship is mostly dominated by the quarters of the rest of the ship. Recreation hall located towards the middle rear of the fore section. Secondary engineering sections exist alongside the primary engines. Manual controls for the ship exist here. There are maintenence conduits going through many corridors to important parts of the ship. the largest ones are called warp conduits and carry enrgy to the engines from the main generators and any backup generators that are turned on. A medical center that rivals that of the Terra-class exists on an entire hangar level. Emergency medivac ships, troop transports, and other vessels can dock directly onto the facilities for quick treatment. The massive hangar makes up the majority of the aft section of the ship. Large in all proportions, it is cylindrical in shape with a massive bay door on the top and bottom, allowing easy access for the many ships which need to swarm in and out. Each ship dedicated to duty on the carrier has its own docking port, complete with custom refitting, launching, and loading systems. The mammoth size of the ship does not allow for massive amounts of plating, as it already is fairly sluggish. Despite this, the Neptune is just a short margin behind the Mars in armor. Considering the fact that the Neptunes are defended by several support ships, they are still more survivable than the Mars. The Neptune-class contains enough vessels to save the entire crew. The warp drive allows the ship to move many times the speed of light. During battle, the warp drive allows the ship to change it's direction of travel surprisingly fast given its size, by use of warp conduit output ports flanking the ends of the aft section. Neptunes use a high-efficiency Plutanovicz Shielding system. Pulse laser arrays(20): these weapons are the best defense against fighters, projectile weapons, boarding pods and shuttles available. they are placed all over the hull under panels, and come out when needed. 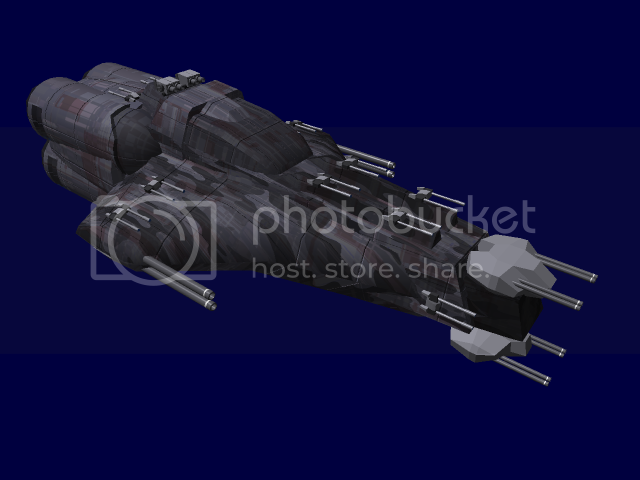 The Glaive class heavy corvette was designed to fill in the combat gap left by the much smaller fighter vessels, as well as giving support to the Mars class. The Glaive has the durability to survive AA fire, while at the same time being too small and agile to hit with heavier anti-warship cannons. The greatest threats to the corvette type are torpedos and heavy fighter vessels. However, torpedos generally target the larger vessels, and heavy fighters find their match in the dual pulse laser arrays on the ship. This makes the Glaive a formidable predator, since it is difficult to combat and heavily armed. It is a thoroughbred warship killer. The corvette type has existed throughout the entire history of naval warfare. It carries the traits of agility and speed. However, a heavily armed corvette can be very formidable. Despite its size, these vessels can inflict impressive damage on their larger cousins. Today, it is often either a light scouting vessel or an agile combat ship. The Glaive class is an advanced combat vessel developed to fill in the current combat gap left by the light vessel types. The Glaive is a strong support ship, using it's Wave Dispersal Array and MAC Guns to soften up vulnerable ship segments for larger fleet ships - i.e. Mars destroyers - to bombard. There is no armory on the ship. The bridge is a small room dominated by a large viewing window. Stations for 9 of the crewmen are in here, including two gunners, all pilots, captain, engineer, and first mate. The captain gets a room to himself, no larger than any of the communal bedrooms. Not very lavish. There is a cargo room filled with supplies, enough to last about twice as long as any scouting mission takes. Two pairs of bunks are in each of three rooms next to the captain's. Limited living space inside. One bathroom in each room. The auxiliary cargo hold can double as a small game room... if the crew can find games to furnish it with. The lower deck consists of a small room between the power core and the engines, providing direct manual access to both. Most are easily accessible from engineering, since the ship is so small. Closest room behind the bridge, across from the captain's cabin. One short hallway extending from the bridge to the end of the ship. None. 2 single man escape pods are present at the back of the bridge. Light combat plating present in most fighters - enhanced or double-layered in most spots. Virtual AI interface, can interlink with ASIAN units from other vessels. 2 single man escape pods located at the back of the bridge. There is a life support system throughout the ship that constantly cleans and recycles air. it utilizes a photosynthesis-like process to clean the air and create sugars which may be used on foods. Secondary conventional engines are present on the wings next to the shield arrays. These are used for boosted speed in combat. The Glaive uses a high-efficiency Plutanovicz Shielding system, placed out on the wings for maximum efficacy. Wave Dispersal Cannon Array(1): Mounted beneath the bridge of the ship, the dispersal array is linked directly to the power core. The concept behind this weapon is not dissimilar to the Solaron Cannon: it uses the ship primary power core's auxiliary power to charge a highly focused beam weapon. However, the wave dispersal array is much different in practice: it is essentially an EMP device. It can use a charged blast to completely disrupt a fair-sized segment of shielding on a vessel. The cannon essentially uses a multi-spectrum blast to effectively knock out almost any shielding frequency. In some cases, if the shielding is weak or deactivated, excess energy from the beam is capable of knocking out secondary ship systems at the site of impact. Damage: Extremely heavy to shields. Useless against armor. Rate of Fire: Must charge a blast for approximately 45 seconds, cool down time is app. 3 minutes. Payload: Unlimited as long as the ship provides power. Notes: The area of shielding affected is generally large enough for several destroyers to get clear shots through. Accuracy at hitting this spot is harder from farther away. Pulse laser arrays(2): these weapons are the best defense against fighters, projectile weapons, boarding pods and shuttles available. They are placed on the tail and bottom of the hull, to fire at incoming fighter ships. MAC Gun (Magnetic Acceleration Cannon) (2): Top-mounted, uses high powered magnets to launch super-heated projectiles. Used in broadside battles with full-sized enemy ships. The cruiser moves within their shields and fires off a volley of MAC fire, delivering heavy damage to armor. Damage: Extremely heavy damage to armor. Poor at penetrating shields. Payload: Massive 4,000 round clips mechanically loaded. A light cruiser can easily hold 20 of these clips on top of their other cargo. Notes: MAC guns effectively punch holes through almost any armor. The Uranus-class Frigate is the newest Terran line warship. built to augment the Terran's aging fleet of mostly destroyer and corvette-class vessels. The Uranus is extremely heavily armed for its size, and provides the most firepower for any ship in its size class, bringing a new edge to Terran's fighting capability. Faced with a fleet of aging, innefective warships, and lacking the resources to make enough large warships to make a difference in the war, the UTR designed a ship that would take advantage of newer technologies such as Energon drives to give it the battlefield capabilities of a much larger vessel. **Maximum Capacity:** 1,000 can fit aboard in an emergency. There are enough dual-occupancy rooms in the ship to house the entire crew. officers get their own rooms. The Uranus class has Thick Duratanium plating, making it the third most heavily defended ship, behind the Jupiter and Terra. The Uranus-class contains enough escape pods to save the entire crew. The Main STL propulsion is provided by four large Energon diffusion thrusters, which convert the energy from the Energon drives directly into an extremely powerful high-speed plasma. Ships traveling too close behind the ship can be damaged or even destroyed by the thruster wash. The Uranus uses a high-efficiency Plutanovicz Shielding system. The Uranus' Shield system is extremely powerful and specialized, projecting a network of hexagonal shield sections, which rotate around the ship in a fairly random order, allowing damaged shield sections to be moved out of the way. These grid sections may additionally be turned off individually, allowing the ship to fire through the shield without having to completely turn it off. Turbolaser Arrays (2): These weapons are anti-starship shield penetrating weapons. They can also be anti-shuttle or used as an active countermeasure against solid projectile ammunitions. Ionic Burst Cannons (2): The Ionic burst cannons fire a large-cone burst of shield and electronic scrambling ions, which are used to disable enemy ships, making them easier to be destroyed. Notes: Acts as 'Heavy' when used against shields. Mini-nova Cannons (4): Mini-Nova cannons are a large starship weapon based on the principles behind the Solaris cannon, but on a much smaller scale. While not really much more powerful than Turbolasers, Mini-nova Cannons have an odd piercing effect, and tend to poke holes through ships rather than blast chunks out of them. Payload: Unlimited so long as the ship provides power. The Jupiter class battleship was the largest ship ever conceived, until the production of the Terra class over a century later. 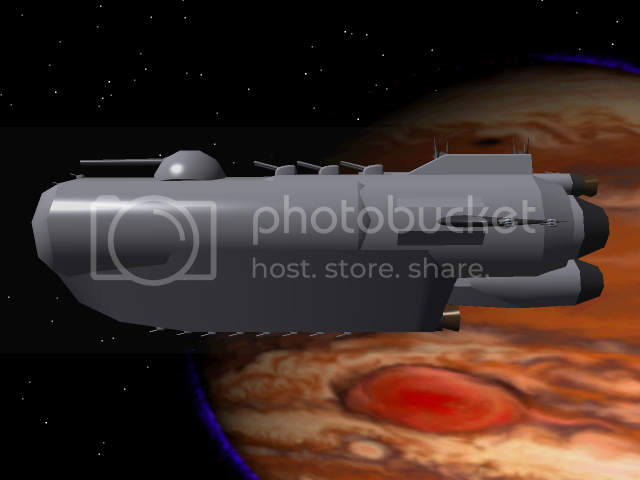 The Jupiter is a heavy combat, carrier, and planetary bombardment vessel. In its hey-day, it was at the pinnacle of space warfare: extremely heavy armor plating and vast weapons batteries allowed it to plow through any ship smaller than it. The wealth of laser turrets and torpedo tubes exist for an important reason: to stop anything from getting a chance to hit it. A single Jupiter class ship was capable of defeating an entire battle formation on its own. The Jupiter class was conceived in the years of the Rimworld Rebellions 130 years ago. A flying behemoth, it served as the flagship of the OUTO Armada in crushing its opposition into oblivion. The Jupiter has never been defeated in open combat. Bridge: The bridge is nestled safely within the center of the ship. Decks 50 and below are all hangar and weapons battery decks. The primary armory is situated near the stern of the main hangar deck. It contains weapons lockers, a briefing room, and replicators for all of the marines onboard. The bridge is situated deep within the heart of the vessel. The large room is filled with various stations for every major job in the ship. In the center are large helm stations for the pilots, and towards the back is the captain's chair. A somewhat comfortable room near the bridge. The suite is several times larger than regular quarters, and has an extensive computer relay station for monitoring the ship. Located towards the top of the ship, the cargo areas take up the majority of two decks. Situated in the majority of the levels between the cargo decks and deck 50, there is a wealth of space for crewmen. Every crewman has a 10x10 room, with communal bathrooms in each section. Several athletic and entertainment facilities are spread throughout the crew decks. Most of the rear quarter of the ship is dedicated to engineering and the engine rooms. Large power conduits run throughout the ship, some taking up large segments of decks. They are easily reached through access spaces. There is a hospital situated on the hangar level near the armory. All passages are approximately 2.5 meters wide and 3.5 meters high. They are generally only lit along the edges of the floors in unimportant sections. More important areas have bright wall lighting running the lengths. The ship has a single, enormous hangar bay stretching across most of its length. The hull is made of some of the thickest plating known to man. Since the ship does not use shields, it relies on its tough armor and various weapons systems to protect itself from damage. Since the ship has been refurbished, it carries standard computer systems used in most Terran warships. The ship wasn't built with surrender in mind; the only emergency countermeasure is a self-destruct power core overload sequence. Low-grade carbon filters keep the air fresh, albeit must be changed every refit cycle. Oxygen ports allow reserves to be replenished when the ship is docked. The ship's combustion drive is old, but is still highly functional. It has been retrofitted with rush job warp engines, giving it decent light speed capabilities. The Jupiter hails from an era when shielding was in its infancy. As such, retrofitting shields to the vessel takes considerable time and effort. 100 meter Turbolaser Pulse Cannon (1): This massive pulse cannon is a step down from the Solaris Cannon in destructive power, but is still capable of punching a hole through a Drake. Damage: Heavy - does light damage to anything within a 20m radius of the pulse, and is capable of knocking through shields and ripping through armor in a single shot. Payload: Effectively unlimited, will function so long as the ship provides power. Pulse Laser Arrays (45): The best defense against fighters, projectile weapons, boarding pods, and shuttles available. Damage: Medium - can hurt both shields and armor, the pulse type shot can be calibrated to specific wavelengths to allow instant deactivation of fighter shields, like an EMP pulse. 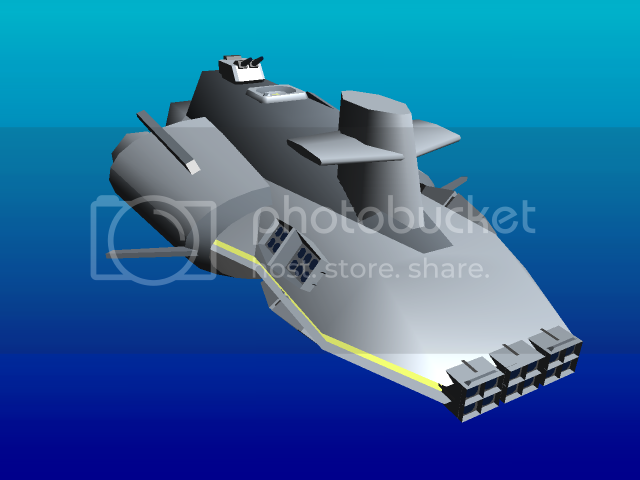 Torpedo and Countermeasure Tubes (app. 200): These ports are capable of rapidly firing torpedoes and countermeasures at a rate of once every 4 seconds. Interchangeably fires between the two based on incoming fire. Countermeasures are purely defensive. Essentially the strategy with the low-range, high-damage torpedoes is to get alongside a ship and broadside them. The strategy is rarely used in modern warfare, which is why it works so well. Enemy vessels rarely carry enough countermeasures to survive the attacks. Damage: Medium - Since the torpedoes are kinetic weapons, they slip right through shields to target critical systems: weapons arrays, hangars, bridges, shield arrays, etc. The torpedoes are more like missiles in nature: they have advanced guidance systems capable of interfacing with each other to perform coordinated attacks and avoid wasting ammunition. Payload: Over 300,000 torpedoes and countermeasures, enough to maintain sustained fire for almost 2 hours straight. Turbolaser Arrays (3): Anti-starship shield penetrating weapons. They can also be anti-shuttle or used as an active countermeasure against solid projectile ammunitions. Damage: Heavy. Does damage to anything touched by the beam, be it shields or armor. By all means, this class should be extinct. However, most of them have been preserved in the years since their decommissioning as giant monuments to the might of the Republic. Since the Drathonian War has broken out, 2 of the 5 surviving Jupiters - the Hermes and the Byzantine - have been retrofitted with modern armaments and pressed back into service. The other 3 are due back from the ARWW in the next year, with Hymn-like shield arrays. Together, the 6 Jupiters produced were the driving force that ended the rebellion. 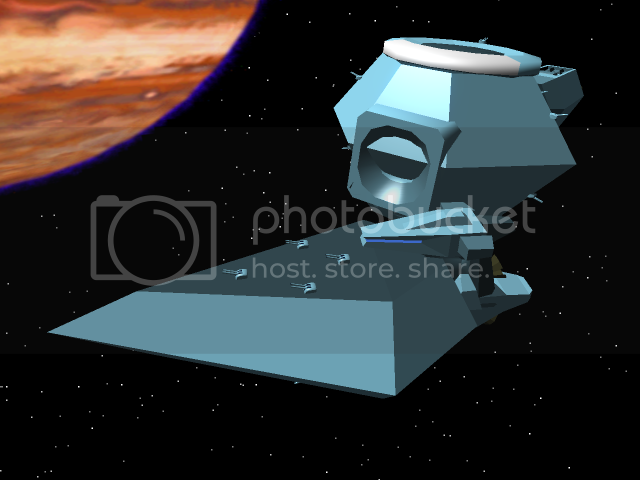 Only one Jupiter has ever been defeated: the Valhalla's Prow was forced to self-destruct in battle to avoid capture. 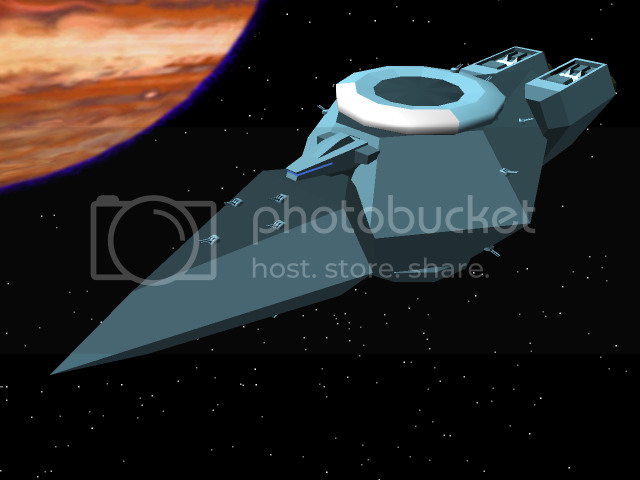 Jupiters were produced with twin ships, with the purpose of having two in each of three Battle Groups.